“Bubble-icious” design concept starts from the observation of popsicle sticks: typically made of wood, once the ice-cream is over, they are thrown away. Hence the users are left with a small and colourful signature toy made of moulded plastic to play with soap-bubbles after enjoying their popsicles. 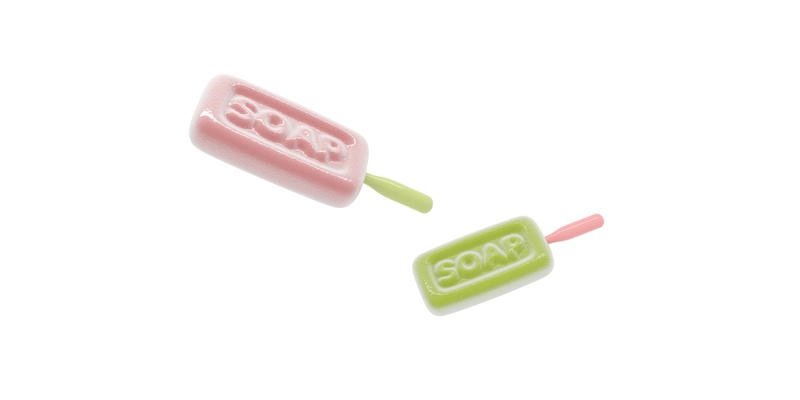 Each ice-cream is shaped like a soap-bar, recalling the freshness and cleanliness experienced while eating, revealing the surprise at the end. The ring at the top of the plastic stick is both functional for playing with soap-bubbles and for not making the ice-cream slide away while eating it. The ice-creams come in two flavors: Pineapple & Basil and Rosewater & Almond, the first inspired by a fruit-salad dedicated to family and friends, the second being a homage to the ancient arabic tradition of sweets and culinary art. Bubble-icious has been designed for the charity “Designer Ice Cream Competition” organized by Bompas & Parr during London Design Week 2018, and ranked 3rd. The three winning designs have been produced and sold in a one-off event held at the British Museum of Food, in favor of Maggies Centres, who freely provide practical and emotional support for people living with cancer, both in the UK and abroad.